Crew: "Rev" Cavin, Terry Cavin, Chris Borer, Tommy Hensley, Brad Derry, The Doc, Bethany Jackson. Sponsors & Support: Perfection Plus, Ritchie Funeral Home, Derry Construction, Spencer Enterprises, Brown Farms, Hulett Auto Salvage, Derry Racing, Shultz Racing, Jon Parrott, my mom, Ed Hensley, Larry Garner, Dan Swartz, Rev, Caden, Quentin, and my family. 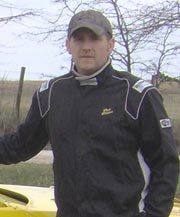 I started racing Karts in 2001 for Bob Booth and won my second night out. I have around a hundred heat race wins, 33 Feature wins, and 3 Championships. Won the Ed Peterson Memorial $500 to Win Feature this past June in Newton. I started out helping my cousin, Shannon Walter, race in the early 90's, and then helped Craig Clark a little. They both retired so I got into a Kart deal, driving for a guy, and have been doing it ever since. After the Karts I decided to move up to Hobby Stock. Have fun and learn as much as I can. Be competitive with a very low budget. I chose the number 10 because my grandpa's car back in the 50's was #10, and my uncles, aunt and cousin were all #10. We have the worst luck known to man!! !